Self-proclaimed “Artivist” Seph Lawless, a pseudonym, has pulled the wool over the paranormal community’s eyes this month. Surprisingly, mainstream media took the bait and fell for it too. Most of the “haunted” houses Lawless photographed and published in his recent book 13: An American Horror Story (Artivist Publishing) are made up. False. Non-existent. “Take that, all you American paranormal suckers!” Seems the joke’s on us, my friends. 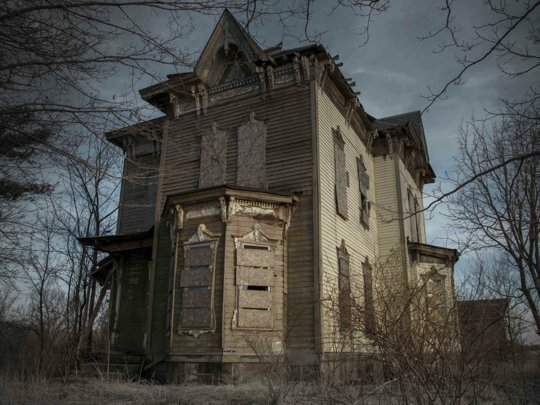 “Nova House Mystery” posted on Friday, November 7th, https://thehauntedlibrarian.com/2014/11/07/nova-house-mystery/, discusses the made-up story about a house in Youngstown, Ohio. Lawless claims that Benjamin Albright accidently shot and killed his son. Bereft with grief, Albright supposedly turned the gun on his wife and then himself. This tragic murder/suicide supposedly occurred in 1958. Problem is no one named Benjamin Albright died in Ohio in 1958. Nor was this person the father of a boy dying in 1958. Research pays off! Since posting this blog, I received numerous comments and emails from people from the area who had never heard this story. Some even did some legwork and visited archives only to leave empty handed. Cater House Estates, Buffalo, New York. Lawless penned a brief blurb for this photograph claiming that Sheriff Donald Caters shot himself to death in this house. In 1968 the home went into foreclosure and has been vacant since. Several people have called this story false. Further, I cannot locate any information substantiating this story. Another piece of fiction. Oliver Family Mansion, Chester, Pennsylvania. Lawless claims that the Oliver family went missing in 1898 and was never heard from again. Nothing turned up on this story. Zilch. Lawless states that a known witch lived in this house and is possibly buried underneath the front door. Again, I cannot locate any information supporting this story. Further, it is easy to prove with radar. However, the address for this home, like the others, is not available. Again, I located an electronic bulletin board asking for any information since no one has ever heard of this. My, my, my. By now, I’m exhausted and disgusted at this juvenile attempt to fool the paranormal community. I did not pay $99 for the book to see whether Lawless has a tightly drafted clause stating that the stories are for entertainment purposes only. However, he has portrayed these stories as true, when in fact, they are not. This is false advertising. Lawless is attempting to deceive readers and the media. This must stop. Poking fun at the paranormal community is abhorrent. Taking advantage of believers by misrepresenting the truth in order for financial gain is unlawful. The paranormal community should stand up and boycott this interloper. We should also ask those who regurgitated his press release if they actually viewed the book and conducted a little research. Just a little research would have caused a journalist to pause. Shame on you, all you copy-and-paste “writers”! Do some research next time.